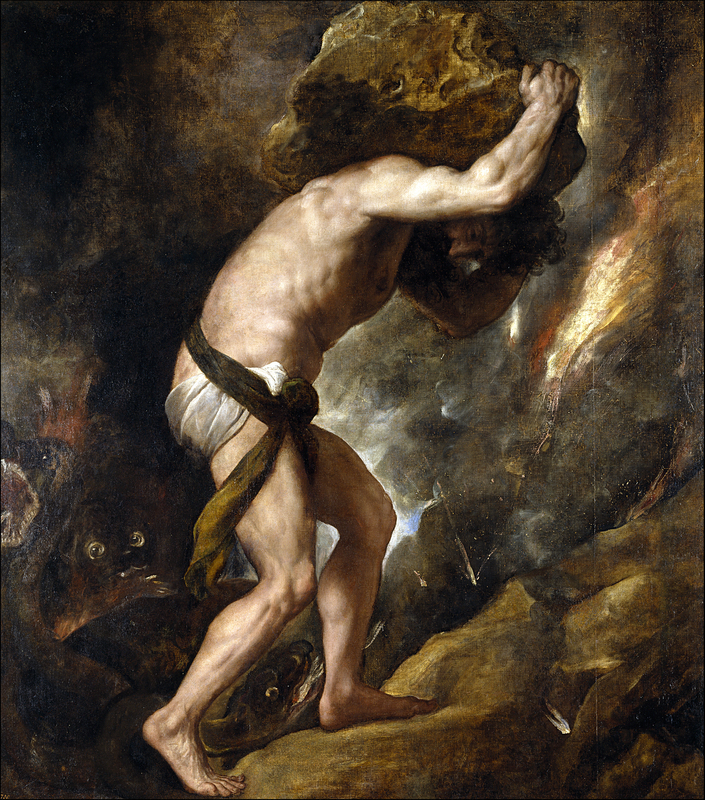 I named this blog Roll the Boulder after the mythological Sisyphus. He is stronger than his rock. The gods had condemned Sisyphus to ceaselessly rolling a boulder to the top of a mountain, whence the stone would fall back of its own weight. They had thought with some reason that there is no more dreadful punishment than futile and hopeless labor. As for this myth, one sees merely the whole effort of a body straining to raise the huge stone, to roll it, and push it up a slope a hundred times over; one sees the face screwed up, the cheek tight against the stone, the shoulder bracing the clay-covered mass, the foot wedging it, the fresh start with arms outstretched, the wholly human security of two earth-clotted hands. At the very end of his long effort measured by skyless space and time without depth, the purpose is achieved. Then Sisyphus watches the stone rush down in a few moments toward that lower world whence he will have to push it up again toward the summit. He goes back down to the plain. It’s in the struggle where Sisyphus realizes his humanity, his consciousness. He turns and chooses to embrace the fate the gods have given him. And in his choice, in his struggle, he realizes his strength. He is stronger than his rock. I choose Sisyphus because he chooses happiness and purpose in spite of his suffering. Where others would see futility and hopelessness and meaninglessness, he finds meaning in the struggle and keeps pushing the rock. Sisyphus rises above his circumstances and makes the best of them, working his task without bemoaning his fate. So that’s my charge. To encourage each other in the struggle and the pushing and the sometimes hopelessness to keep moving and choosing happiness, even in the midst of constant struggle. Roll the boulder. Be stronger than your rock. Thanks for your readership, sweet Colin. I like the double entendre of this idea ~ I’m thankful for your comments. I hope you’ll keep reading. Love to you!